The Virginia State Police were prepared for the protests-turned-riots in Charlottesville, Va., on Saturday that left three dead and dozens injured despite what Governor Terry McAuliffe (D.) has said publicly, a state police spokesperson told the Washington Free Beacon on Monday. "No, the State Police did not have inferior equipment," Corinne Geller, Virginia State Police public relations manager, told the Free Beacon. "Our personnel are equipped, and were equipped, with the necessary protective and tactical gear for their safety and, obviously, to protect those that were in attendance of the event." The State Police did not release specifics on what kind of equipment they employed during the event but did say its officers were well prepared for what they faced on Saturday. "We don't release our tactical gear or anything of that nature for the protective purposes of our law enforcement," Geller said. "They had the necessary inventory and gear that they needed for this event. There were no shots fired at the event or anything of that nature but our folks had the proper gear and tactical equipment they needed in order to safeguard themselves and everybody in attendance." McAuliffe told the New York Times the protesters had better equipment than the State Police, and that accounted for part of the reason police took what critics have decried as a hands-off approach to the violence. "It’s easy to criticize, but I can tell you this, 80 percent of the people here had semiautomatic weapons," McAuliffe told the paper. "You saw the militia walking down the street, you would have thought they were an army. I was just talking to the State Police upstairs; they had better equipment than our State Police had. And yet not a shot was fired, zero property damage." The McAuliffe quote has since been edited and rephrased by the Times in the hours since the piece was originally published but the paper did confirm the quote is accurate. "We regularly edit web stories—especially breaking news stories—to refine the story, add new information, additional context or analysis," Danielle Rhoades Ha, VP of communications for the paper told the Free Beacon. "We only make note of changes if they involve an error. Making note of every change is unrealistic and would not serve the reader. In this case overlapping information was trimmed due to space limitations for print." "Yes, the entire quote was accurate. The current version of the story includes portions of the quote and paraphrases it." Virginia State Police referred the Free Beacon to the governor's office for comment on his thinking but speculated he may have been "speaking in generalities." The governor's office did not respond to repeated requests for comment. The situation in Charlottesville, where white supremacists and neo-Nazis gathered in opposition to the proposed removal of a statue of Confederate general Robert E. Lee, descended into violence despite the presence of Charlottesville Police, Virginia State Police, and the Virginia National Guard. Neo-Nazis and antifascist forces clashed in violent brawls throughout the city and throughout the day. At around 1:45 p.m., 20-year-old James Alex Fields Jr., a neo-Nazi sympathizer, drove his car into a crowd of counter protesters, injuring 19 and killing 32-year-old Heather Heyer. The State Police defended their efforts to police the event and said they were actively involved in breaking up violent encounters. "There were physical barriers in place for folks to be able to use for their safety. We cannot tell people where to assemble, there's freedom of assembly," Geller said. "There were barriers on both sides with troopers in between to allow for them if they felt like they needed to separate. They had freedom of access throughout the park but it seemed like most of the time one group seemed to collect on one side of the park and others actually collected on the street. There were some bottlenecks, as you can imagine, that did occur." Geller said the large police presence may have added to the impression for some that police were simply letting protesters clash with one another. She said the violence was sporadic and quick moving which hindered their efforts to intervene. "We had a very large number of Charlottesville police and state police there at the scene," Geller said. "So, because there were so many of us it may have had the appearance that there were more standing around than actually acting but there were. You know, our people stepped in to separate. Quite often, as soon as we intervened in an attack or in a conflict then people dispersed and blended back into the crowd. That happened quite often." 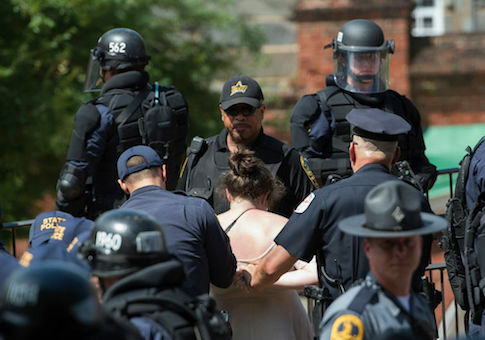 Accounts from reporters on the ground in Charlottesville on Saturday also mentioned the strong police presence and quickly dissipating violent clashes, as well as violent clashes where police did not intervene. The State Police deployed personnel throughout the city to deal with the wide-ranging violence. "There were other instances where we got calls where people were walking and gathering, coming to the rally, they interacted and had encounters in different places," Geller said. "As we would respond, a lot of times those skirmishes and situations had already broken up and dissipated. That's one reason why we had personnel stationed throughout the city: so we could respond." Geller said the police were inundated with emergency calls but were active in policing the event. "Under the city of Charlottesville, they fielded 250 calls that day for emergency situations. So, we were not standing around. Our folks were actively observing and stepping in when needed." This entry was posted in National Security and tagged Police, Terry McAuliffe. Bookmark the permalink.